GreenMelt® Ice Melt Salt is the ideal choice when you need to see the results – both in application, with it’s easy-to-see green tint, and effective ice melting. GreenMelt® Ice Melt Salt Blend is commercially balanced to give sidewalk and parking lot crews a critical 20-minute jump start from its Calcium Chloride, coupled with 60+ minutes of extended melting action from its Sodium Chloride. It is an economical and effective ice melt and works down to -5°F/-21°C. 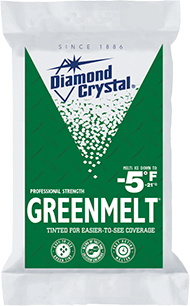 GreenMelt® Ice Melt Salt Blend contains a specially formulated blend of Calcium Chloride and Sodium Chloride for quick-melting action. It is tinted green which makes it easy-to-see for better application coverage. Directions: Remove slush and as much loose snow as possible before ice melt application. Spread GreenMelt® ice melt evenly across surface area. Apply ½ – 1½ cups per square yard, depending on ice thickness and air temperature, as needed. Reapply as necessary. When ice and snow soften, remove slush and any excess ice melt from pavement for good concrete maintenance.